Your fencing needs to be an extension of your home. If you have a modern-styled home, it needs modern fencing. If your fencing doesn’t match your home, you won’t achieve that wonderful flow and sense of unity that gives a property a personality and a sense of wholeness. Here are some examples of modern fencing ideas to suit your contemporary property. 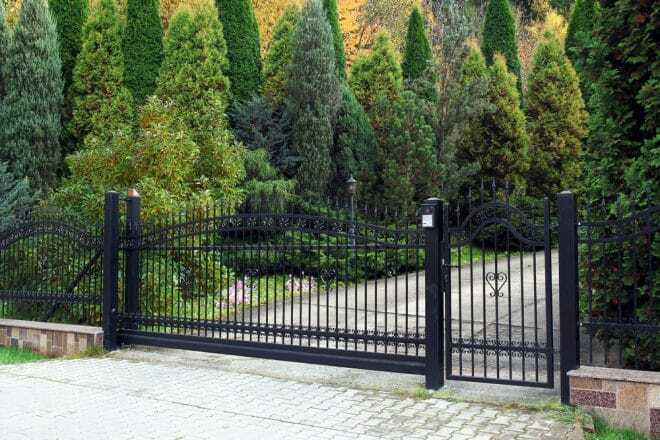 Read through the options below to find the right modern fence for your property. Whether you go for a wrought iron or aluminium alternative, this type of fencing is both classic and modern. They are durable, look incredible and can be painted almost any colour. They can also be customised to suit virtually any aesthetic, go for angular and edgy or straight and minimal – the choice is yours. Again, this is a classic option that works with a modern look because it can be infinitely customised. With some lattice, you can turn your wooden fence into a climber wall. You can even add mini garden beds to it and turn your fence into a vertical garden or green wall. The beauty of wooden fences is they are quick and easy to erect, so you’ll save on labour costs. Slats offer the ultimate in design versatility. They can be spaced and hung however you like, and powder coated to look like high-end hardwood or left bare for a classy, industrial look. Going horizontal gives you privacy without completely shutting you out, and going horizontal is perfect for preserving a view. This option looks incredible with a beautiful patch of turf or lawn. Bamboo stalks can’t work as a stand-alone fence, but when framed or backed by stained wood it is a great contemporary option. Bamboo fencing is excellent for properties trying to create a tropical and natural feel, it is cost-effective and easy to set-up. They’re also great for gardens that need plenty of light, and bamboo won’t create large shadows and block the precious sun. Concrete is becoming a hugely popular fencing option for modern properties. It gives you all the benefits of concrete, and it looks like a high-end option without the high-end price. You can hang artwork on it, and paint and stencil it however you like. It will last forever, and, you can redesign it using decorative concrete techniques. You can even have geometric gaps in the concrete for a design feature that helps to let light into your property. Nothing is more modern than using recycling to design your home. A cheap and easy way to build a fence for your home is to recycle wooden pallets. You can use them in their entirety and bracket them onto fence posts, or link them together in squares. You can even remove each individual plank to build an entirely new fence. Using them on an existing fence is a great way to create a hanging garden. Colorbond is one of those rare materials that look both classic and modern. It’s been used in the Aussie home for decades because it looks good and it’s tough. You can go for a seamless Colorbond look or have visible posts made out of wood, brick or even concrete. These posts help to divide the look and create contrasts with the metal. Thanks to laser cut technology, you can customise designs as much as you like. You get the modern aesthetic of aluminium, while still enjoying plenty of style. The gaps in design also mean you can give your garden plenty of sunlight. There’s also no maintenance involved, no painting, no treating just a perfect looking fence for decades. This is a super modern option made out of a super modern material. Modular fencing is stylish and incredibly durable. It’s also cheaper than brick or concrete while offering the same security. Perhaps the best feature is the soundproofing qualities. If you live near a busy street, or in a noisy area this is a great contemporary option for you. All of these options will allow you to create that sought-after feeling of unity between home and landscape, and exterior and interior. With the right choice, your fence can turn your house into a home. If you’re still unsure about what will work with your property, give the fencing experts at Everlast Services a call. We’ll be happy to provide you with some ideas and even offer a free, no-obligation quote.